Residents and workers in a major Pakistan city are exposed to harmful levels of pesticides, new research reveals. 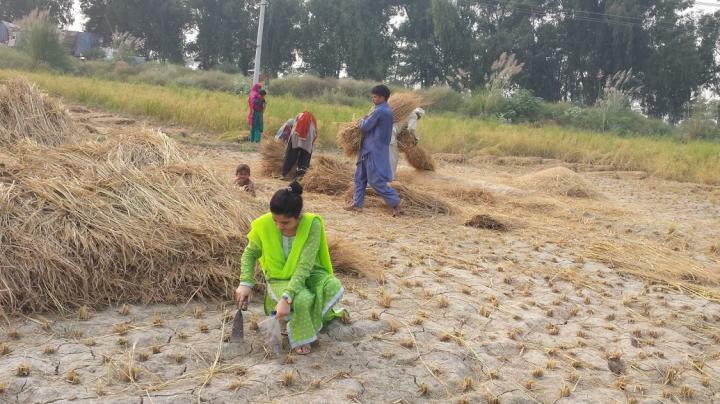 Scientists from Pakistan's F Quaid-i-Azam University and Lancaster University have evaluated the organophosphate pesticide concentration in dust from farms and also from pesticide manufacturing plants in the megacity of Lahore. Researchers tested 50 dust samples as well as blood and urine samples from more than 500 men aged between 20 and 55 – including farmers, factory workers, shopkeepers, rural and urban residents, and compared them with a control group. The results show dust in and around Lahore contains pesticide pollution that is a high health risk to all groups tested. The most prominent pesticides were chlorpyrifos and diazinon, which has been outlawed for residential use in countries such as the US. It can affect humans through inhalation, ingestion of through absorption through the skin. Urine samples, which were taken from people living in both rural and urban areas of Lahore where contaminated dust was found, were found to contain high levels of biomarkers associated with chlorpyrifos and diazinon contamination. Biomarkers in blood samples also suggest oxidative stress was experienced by all subjects when compared to the control group. Although not a conclusive link, a known risk of exposure to insecticides is disturbance to the anti-oxidant defence system. In addition, the study subjects were also found to have lower levels, compared to the control group, of an important enzyme needed for the nervous system. The results suggest that dust contaminated with pesticides engenders 'significant health risks' particularly related to the nervous and endocrine system. These risks affect not only workers directly exposed to pesticides, but also nearby residents. Dr Crispin Halsall, Reader at Lancaster Environment Centre and co-author of the study, said: "The high levels of the indicators found in the urine of rural and urban residents show that in the city of Lahore, dust dispersing from industrial sites and farms are major contributors in human insecticide exposure – in addition to pesticides found on food. "The manufacture of pesticides such as chlorpyrifos and diazinon as well as their over-use in agriculture is a serious health risk and needs to be addressed as a priority for worker and general population health in Pakistan." Dr Riffat Naseem Malik said: "They (Pesticides) are a matter of grave concern, requiring more and more probing. We need to evaluate and decide on benefits against their deleterious effects on environment and thus to human health, before it's too late." Pakistan is the second biggest consumer of pesticides in South Asia and its use is rising. Globally around 200,000 people die each year in the developing world due to organophosphorus pesticide poisoning. The study by scientists from Lancaster University and led by researchers from F Quaid-i-Azam University has been published in the paper 'Pesticides contaminated dust exposure, risk diagnosis and exposure markers in occupational and residential settings of Lahore, Pakistan' by the journal Environmental Toxicology and Pharmacology. The paper's authors are Sidra Waheed and Riffat Naseem Malik, from the F Quaid-i-Asam University, and Crispin Halsall, Andrew Sweetman and Kevin Jones from Lancaster University.